The series, which runs for 10 episodes, is not an origin story — although origins are important. The members of The Umbrella Academy are all grown up now, after a childhood spent in the limelight. One day in 1989, 43 babies were born to mothers who were not pregnant the day before. Seven of them were purchased by an eccentric billionaire, Sir Reginald Hargreeves (Colm Feore), who trained them up as The Umbrella Academy to be crime fighters — and perhaps something more. Over the years, most of the seven left the academy and struck out on their own (major daddy issues being at the core of it all), but the death of their “father” has brought them back together for something exceptionally important. There are a lot of characters presented all at once, but one of the The Umbrella Academy’s many strengths is that it understands the importance of a good montage. Those, augmented by a killer soundtrack, help make everyone stand out and immediately recognizable. There’s Number 1 / Luther (Tom Hopper), who has been on the moon for the past 4 years and possesses super strength; Number 2 / Diego (David Castañeda), a Batman-like vigilante who is talented with knives; Number 3 / Allison (Emmy Raver-Lampman), a celebrity who can change reality by speaking “rumors” out loud; Number 4 / Klaus (Robert Sheehan), a junkie who can commune with the dead — when he’s sober; Number 5 / No Other Name (Aidan Gallagher), a 13-year old who time-traveled to the future where he was trapped for 50 years, and has returned to the present in his childhood body; and Number 7 / Vanya (Ellen Page), a violinist with no superpowers, considered a dud who was never allowed to join in with the rest of her siblings’ training. (Number 6 / Ben was killed in an unnamed event before the series begins). And what are the numbers for? Oh, their father ranked them in order of their usefulness to him, of course, and had no time for names! (Names came later, at random). 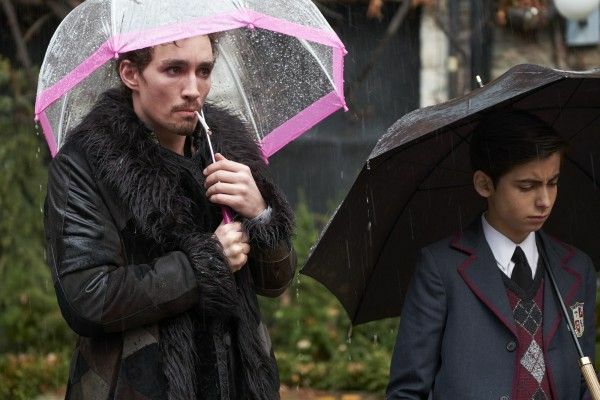 The Umbrella Academy is quick, quirky, and light, although there are real stakes and consequences that play out over the course of the season. Number 5, for example, is being hunted down by a mysterious pair of assassins named Hazel (Cameron Britton) and Cha-Cha (Mary J. Blige), who give off strong Fargo villain vibes. There is a high body count in the series, starting from the very beginning, but the show is never dark or dour. It flits around among the siblings — who are all now nearing 30 except for Number 5, who is both an old man and a teenager — as they go off on their own adventures solo or in pairs. The interactions among the group are always a delight, especially when the charmingly sarcastic Klaus is around (Sheehan gives a really sweet and vulnerable performance here, and one that is full of comedic physicality), and the series expertly makes us invested in how these relationships develop or breakdown after so many years apart. This first season focuses on an apocalypse which Number 5 witnesses in the very-near future, along with the mystery of how to stop what causes it. The narrative jumps around in time and place, revealing background stories of how the siblings got to be who they are now, and filling in some of the gaps about their collective past. The episodes, which take full advantage of their hourlong runtime, are also not beholden to any particular structure (it’s creative in every aspect, from the placement of its opening title to the overall storytelling). But it’s all part of the fun. Like the CW series Legends of Tomorrow, The Umbrella Academy has a talented cast and a bonkers premise that improbably add up to a series full of humor and compelling drama. And, refreshingly, the members of the academy don’t really rely on their powers very much. It’s strangely both the focus of the series and something taken casually in stride, like the fact that the kids were raised by an android mother and looked after by a talking chimpanzee butler (which all feels mildly Neo Yokio-esque). Anything is possible in this show, and yet those eccentricities are presented as nothing more than subtle quirks. Savvy TV viewers will be able to guess some of the show’s twists before they happen, even without peaking at a Wiki or stumbling upon spoilers (sometimes the dialogue is a little clunky, but it’s forgivable). However, the joy of Umbrella Academy is that you can never predict the path the show will take to get to these reveals. The group is on a particularly zig-zagged route to the final crescendo, but it’s all in service of building up the emotional intensity of that confrontation. It’s frankly difficult to think back to how everything began in this crazy show after having buzzed through its 10 episodes, because it’s so full of layered narratives. Don’t look up spoilers, though — knowing less is more. Not having read the books, I can’t speak to the Netflix series’ success as an adaptation. But as a superhero-tinged TV show, it gets everything right. The Umbrella Academy is incredibly interesting, enjoyable, quirky, and well worth your time. The Umbrella Academy premieres Friday, February 15th on Netflix.